In my experience, American music is not a staple of the symphony orchestra repertoire. It’s February, and in my orchestra, the South Bay Philharmonic, we are already well into our rehearsal cycle for the winter concert. It is going to be a “Three B’s” concert: Bach, Beethoven, and Bruch, three well-known and beloved non-American composers. Last concert we did something different. 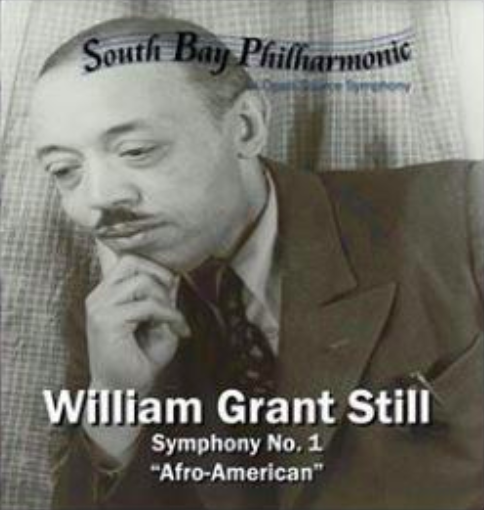 The program included William Grant Still's "Afro-American" symphony, written in 1930 and first performed in Rochester NY, and a movement from Dvorak's "American" string quintet No. 3, Op. 97, written in Spillville IA in 1893. Neither of these pieces was known to me before I started preparing them for this concert, and I'm writing about them here to bring more attention to these American masterpieces. Still gave each movement a title: Longing, Sorrow, Humor, and Aspiration, and he included with the symphony some short poems of Paul Laurence Dunbar. Once you figure out how to read the manuscript, the symphony is challenging, but not intimidatingly so. It uses jazz, blues, and gospel themes in a traditional, tonal, 4-movement structure. It also employs a banjo in the 3rd movement. I immediately said, as a shorthand, "oh, it sounds like Gershwin." It turns out plenty of other people think so too. Still and Gershwin knew each other and played music together. Although scholars don't agree on this issue, it is possible that Gershwin borrowed the famous "I've got rhythm" motif from Still. The same motif can be heard clearly in the symphony's 3rd movement. The "American" quintet was written immediately after the more famous "American" quartet, during the summer of 1893 when Dvorak was living in Spillville IA. In fact, this piece isn't always referred to as "American," although there are a number of high-powered reviewers and references who use the term, for example this review from Gramophone, or this clip from the BBC. Reviewing this concert to write the blog, I realize that so much is missing from this account. It's very hard to write program notes; one is tempted to say "Just listen to the music!" But I hope that these lesser-known American masterpieces will find their way into more concert programs in the future! February 4, 2019 at 07:55 PM · I'm curious what makes you think the William Grant Still manuscript part is in the composer's own handwriting? It looks to me very much like other manuscript parts from the era; music copyists were a thing and most likely these parts were done by one of the usual copyists. I agree that the piece itself is charming and worthy of more performances. Mary Ellen: some of the scholarship on the symphony indicates it. Multiple biographies note that Still was his own copyist until about 1960. We're playing the 1969 revised version (the second of two revised versions) of the Still symphony off parts that I heard were loaned to us directly by the Still family. The handwriting is identical, and some of the changes appear to be hand-marked on an older published edition (which was also presumably in Still's own hand). 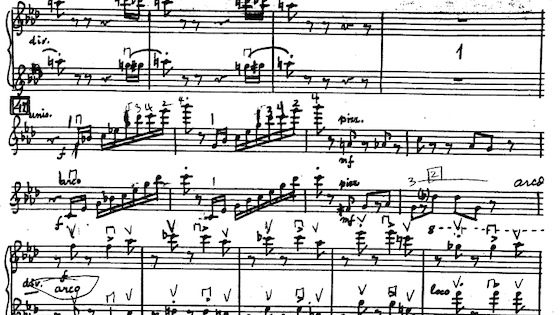 For example, a six-measure cut near the end of the symphony is marked in the same handwriting as the rest of the music. February 4, 2019 at 09:02 PM · I performed that Still symphony last year in my community orchestra and really enjoyed it. Ditto the copies from the composer's family, and they were very helpful in assisting us with questions and whatnot. Also, we got a great, unusually diverse audience for that concert, thanks to some contacts with the NAACP and similar organizations locally. 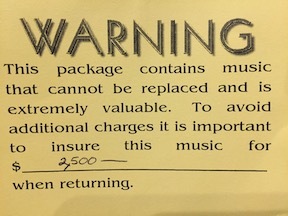 February 4, 2019 at 09:25 PM · Amusing that Luck’s, a reprint house, claims the music can not be replaced. February 4, 2019 at 09:41 PM · Karen - thanks for sharing the great experience of playing Still's symphony. I wish my orch would delve a bit into the African-American and white American repertoire more. It has been years since we even played Copland, which is the only classical American music (other than some pieces by local composers composed for us) we ever played in the 19 years I have been with the group. February 4, 2019 at 10:43 PM · About the melodies that remind of Gershwin... there are also spots in the first and second movements that resemble melodies in Porgy and Bess. (The symphony predates Porgy and Bess by five years.) The one in the first movement, at least, is borrowed from a third source. Both the first movement theme in Still's symphony and "Summertime" in Porgy and Bess borrow the same motif from W.C. Handy's "Saint Louis Blues." February 5, 2019 at 01:49 AM · I always thought that ”Summertime” was an homage to the Ravel Sonata. Or did that borrow from the same place? February 6, 2019 at 12:01 PM · Thanks, very nice piece, beautiful. I am glad to hear. And again I am proud to the composer from my country Antonín Dvorák (Czech).